Convenient lease plans are now available to you. Login with your account details to access the product files and check how you can easily spread the payment of your machine. Designed for experienced locksmiths and professional key cutters, Triax Pro combines reliable performance, effortless use and is made exclusively from select components. 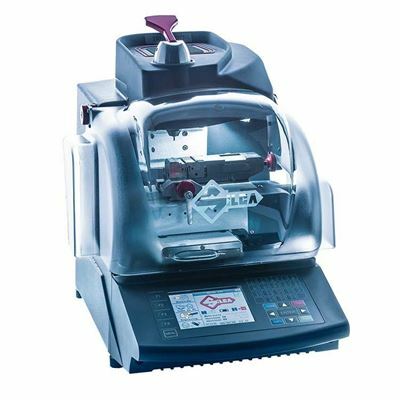 The machine can work both in stand-alone mode or with a PC connection that enables you to access the largest key database available on the market via user-friendly software. The machine is available also as UTP (Unlimited Token Plan) version. 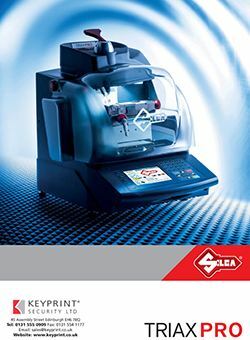 Cost-saving and flexible jaw system: The clamp features the easy-change jaws like Futura, ensuring faster installation and lower costs. This space-saving, dovetailed solution is compatible with all existing Triax clamps and, because the jaws are the same, fully interchangeable with Futura. Tools and accessories close to hand: The cutter holder fits 14 tools and is incorporated into the machine for comfortable access. On top of the machine there is a utensil tray with a non-slip mat to help you keep your workbench neat and tidy.